The Zmachine Insight+ processes a single channel of spontaneous EEG data from the differential-mastoid (A1-A2) location to determine the sleep stage of the user as either wake, light sleep (N1 & N2), deep sleep (N3) or REM. The sleep staging output is updated every 30 seconds throughout the recording. The Zmachine contains an integrated low-noise, wide-bandwidth EEG amplifier, high-speed impedance measurement circuitry, and an on-board processor running the sleep staging algorithms. The hardware and algorithms are all FDA cleared. The standard PSG channels were scored independently by two to four certified polysomnographic technologists, using the Rechtschaffen and Kales (R&K) visual sleep staging guidelines. The individual score files were then combined, on a 30-second epoch basis, using a majority voting rule, to generate a single score file per subject (“Consensus Scores”). EEG data acquired from A1-A2 was processed by the Zmachine sleep staging algorithm (“Zmachine Algorithm”). The performance of the Zmachine Algorithm was evaluated by comparing against the Consensus Scores. The Zmachine first classifies a 30-second epoch as either wake or sleep (any stage). The Zmachine Algorithm, as compared against the Consensus Scores, has a sensitivity for detecting sleep of 95.6% with a specificity of 92.8%, and an overall Kappa agreement of 0.85. The most advanced monitor is worthless if your patient can’t apply the sensors correctly and actually fall asleep with the system. The Zmachine was designed, from the earliest days, so that your patient can quickly, easily, and accurately, apply the EEG sensors themselves and sleep comfortable with the system night-after-night. This was achieved through use of the advanced Zmachine Comfort 40 sensors and the mastoid EEG location. The latex-free Zmachine Comfort 40 skin sensors are wet chemistry, silver/silver-chloride, which provides clean signals with no skin preparation beyond the use of a disposable alcohol wipe. These one-time-use, self-stick, disposable sensors assures great skin adhesion, stable performance during sleep, and no risk of cross-contamination between users. The mastoid EEG location enables the sensors to be located completely outside of the hairline behind the ears (avoids red marks and irritation on the face or forehead), easily self-applied and removed, and the location of the sensors does not interfere with sleep. The Zmachine Insight+ system, including accessories, can be purchased for a fraction of the cost of other medical sleep monitoring systems. Record sleep at home! The Zmachine Insight+ provides accurate EEG-based sleep staging information in a system that is easy-to-operate, unobtrusive and patient-friendly. Where patient is most comfortable and sleep is most natural. Uses one-time-use, self-stick, disposable EEG sensors. Sensors are located completely outside of the hairline, and are easily self-applied and removed by the patient. Wake, Light Sleep (N1 & N2), Deep Sleep (N3), REM, Arousals, Total Sleep Time (TST), Sleep Efficiency (SE), Sleep Period Time (SPT), Latency to Persistent Sleep (LPS), Wake After Sleep Onset (WASO), Total Deep Sleep (TDS), Total REM Sleep (TRS), and Time Spent Out of Bed (TSOB) based on the sleep laboratory standard 30-second epoch length. Raw EEG data is recorded to the microSD card at full data rate and resolution (2500Hz/16-bit/Little-endian). This data can be visualized using the Zmachine data viewer software, or loaded into Matlab to perform your own analysis (sample code available in the Support section). The Zmachine includes a powerful, easy-to-use, data viewer program that runs locally on your PC to display, graph, analyze, and organize your Zmachine data. Available for free download in the Support section. The Insight+ can display any combination of Total Sleep Time, Sleep Efficiency, Latency to Persistent Sleep, and Wake After Sleep Onset, or none at all. This feature can be especially useful in addressing sleep state misperception. Using objective EEG-derived sleep state information, the Insight+ can also be programmed to produce an alert to leave bed when sleep isn’t achieved within a pre-specified period of time. This can be helpful in assisting those patients that spend too much time in bed awake in knowing when they should leave bed and stop trying to fall asleep for a while. Your purchase includes the Zmachine system, clinician Key, EEG patient cable, wall charger, microSD-to-USB card reader, fitted travel case, and printed patient guide. Zmachine Comfort 40 EEG sensors sold separately. The Zmachine Insight+ is classified by FDA as a standard polysomnograph with electroencephalograph. An article in Sleep Review Magazine indicates that CPT 95827 (overnight EEG) has been used successfully by board-certified sleep physicians, sleep centers, and neurologists in conjunction with ICD 9/10 codes for insomnia, hypersomnia, or mood disorders using patient-applied overnight EEG equipment of this type. *Provider is solely responsible for determining the applicability of any reimbursement code prior to use. The Zmachine Data Viewer program is available for free download. The data viewer runs locally on your PC to both visualize Zmachine output and organize the Zmachine data files. 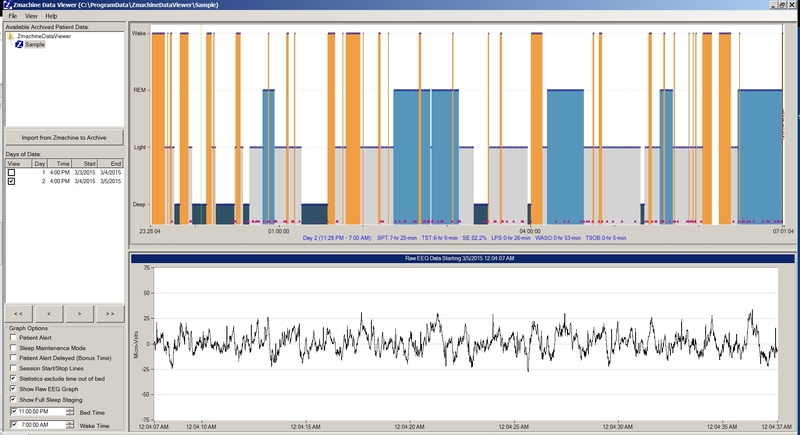 With the data viewer, you can view sleep staging information with 30 second resolution, display summary sleep statistics for each night (in blue directly below the staging graph), and visualize the raw EEG data that was used by the sleep staging algorithms. What do I do when I run out of Zmachine Comfort 40 sensors? General Sleep offers Zmachine Comfort 40 sensors by the case. Each case contains 40 packages of sensors (enough for 40 nights of use), and can be obtained directly from General Sleep. Do you have a list of publications? D'Antonio I. and Pituch D.W.
Dietch, J.R. and Taylor, D.J. Dunn L, Kleiman A., Forkin K., Quigg M., Bechtel A., Huffmyer J. and Nemergut E.
Szczygiel, EJ., Cho, S., Tucker, RM. Where is your (mind)fulness? It matters for sleep. Lipsky, J., Acero, P., Cho, L., Kreidler, P., Zhu, Z., Britton, W.
Beattie, Z., Pantelopoulos, A., Ghoreyshi, A., Oyang, Y., Statan, A., Heneghan, C.
Kay-Stacey M. and Attarian H.
Wang, Y., Loparo, K., Kelly, M., Kaplan, R.
Wang, Y., Loparo, K., Kaplan, R.
Whitcomb, J. J., Edwards, S., Ethridge, E., Fogle, S.
Kaplan, R., Wang, Y., Loparo, K., Kelly, M., Bootzin, R.
Kaplan, R. F., Wang, Y., Bootzin, R.R., Loparo, K.A. Wang, Y., Kaplan, R. F., Bootzin, R. R., and Loparo, K. A.
Richardson, G.S., Kaplan, R.F., Loparo, K.A., Johnson, S.E., Roth, T.
Kaplan, R.F., Loparo, K. A., Nesthus, T.E., Schroeder, D.J. Nesthus, T.E., Scarborough, A.L., Schroeder, D.J., Kaplan, R.F., Loparo, K.A. , and Thorne, D.
Schroeder, D.J., Nesthus, T.E., Scarborough, A., Thompson, J., Kaplan, R.F., Loparo, K.A. How do I view data from the Zmachine? The Zmachine Data Viewer software, which is available as a free download on our website, will run on any computer running the Windows 7 or later operating system, and Apple computers running Windows emulators. This software is powerful, easy-to-use, and runs locally on your PC to display, graph, analyze, and organize your Zmachine data. If you wish to read the files directly (i.e. without the data viewer), all sleep scoring reports and sleep statistic summaries are stored as ASCII .csv (comma separated variable) files. They can be opened directly using Excel, Matlab, text editors and statistics programs. The raw EEG data is stored as 2-Byte unsigned integers (little-endian), 16-bit resolution, and sampled at 2500Hz. Sample Matlab code available in the Support section for loading the raw EEG data files. Why is objective data useful? The very act of sleeping precludes conscious knowledge of time and events, and reliance on subjective self-reports of sleep, without objective data, can lead to an incomplete and potentially misleading picture. With the Zmachine Insight, you can now obtain objective sleep information based on the EEG signal. Automatically scored wake, light sleep, deep sleep and REM is recorded every 30 seconds in the patient’s home where sleep is most natural. Is the Zmachine similar to the Zeo? Not really. The Zeo was strictly a consumer product that made no medical or performance claims, whereas the Zmachine is a medical device that is cleared and regulated by the US FDA, and manufactured in FDA registered facilities. The Zmachine is intended for use by medical professionals, academic and industrial researchers. Is the Zmachine easy to use? The Zmachine Insight+ system uses one-time-use, self-stick, disposable EEG sensors. Sensors are located completely outside of the normal hairline (mastoids and neck/shoulder ground), and are easily self-applied by the patient. As opposed to the forehead or other more obtrusive locations, the location of the sensors does not interfere with sleep. The Zmachine Insight+ is small, portable, and battery operated for safe and convenient in-home use. Is face-to-face training required for patients to learn how to use the Zmachine? No. The Zmachine was specifically designed for convenient, in-home use and requires very little technical knowledge to apply. The Zmachine system includes an easy-to-read User Guide, and General Sleep has produced several short videos illustrating various aspects of setting up and using the system. Is the Zmachine only for use by sleep specialists and researchers? No. While the data revealed by the Zmachine is highly relevant to sleep specialists and researchers, the intimate knowledge of a patient’s sleep can be highly beneficial to healthcare providers across a wide spectrum of medical specialties. Pain Management, Neurology, Sports Medicine, Geriatrics and many others are all discovering new uses for the valuable information provided by the Zmachine system. Through its unique combination of accuracy and ease-of-use, the Zmachine is making information available to healthcare providers which was previously unavailable. What sleep statistics can the Zmachine Insight+ display? The Insight+ can display any combination of EEG-derived Total Sleep Time, Sleep Efficiency, Latency to Persistent Sleep, and Wake After Sleep Onset, or none at all, and is displayed each time the user disconnects from the Zmachine. Information is updated in real time and pertains to the current night of sleep. This feature can be especially useful in treating insomnia patients with sleep state misperception. Does the Zmachine system support remote access? Yes. Data from the Zmachine microSD card can be transmitted via an e-mail attachment or uploaded directly to your web portal. This information can then be imported directly into the Zmachine data viewer. No user identifiable information is contained in the Zmachine data file. Instructions are included with the Zmachine system. Healthcare providers can use this capability to receive the data files in advance of face-to-face visits to improve work flow and/or reduce the total number of visits needed. Researchers can use this capability to work remotely with test subjects to monitor compliance and/or ongoing results. Does General Sleep offer replacement accessories? Yes, replacement accessories for your Zmachine system can be purchased directly from General Sleep. Please contact us for more details. 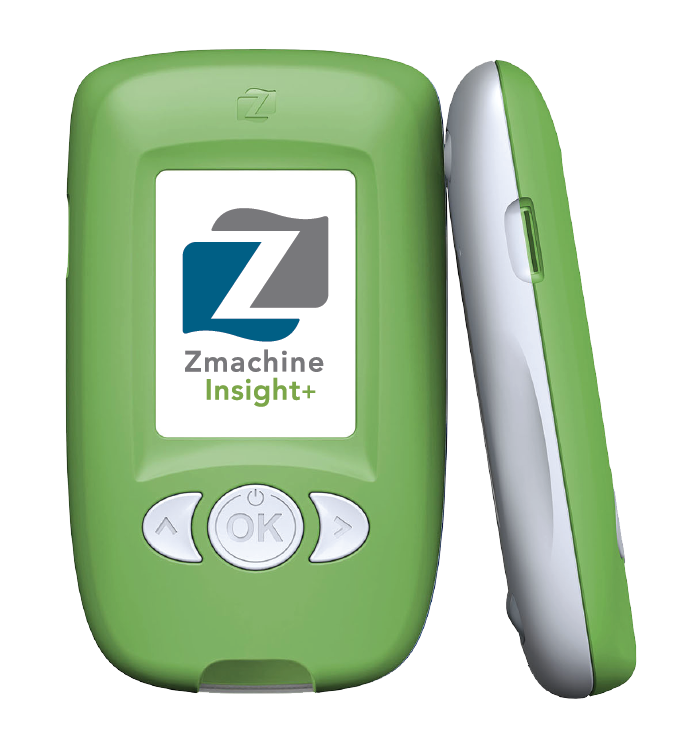 What is CBTi patient alerting in the Zmachine Insight+? Using objective EEG-derived sleep state information, the Insight+ can also be programmed to produce an alert to leave bed when sleep isn’t achieved within a pre-specified period of time. This can be helpful in assisting those patients that spend too much time in bed awake in knowing when they should leave bed and stop trying to fall asleep for a while. The parameters of this alert generation can be enabled/disabled or customized by the clinician. What is the Zmachine standard warranty? General Sleep Corporation warrants the Purchased Product (Zmachine Insight+) to be free of all defects in material and workmanship for two years from the date of Purchase. The EEG cable is guaranteed for one year. This warranty is extended to the Original Purchaser only. Within this period of warranty General Sleep Corporation will repair or replace, free of charge, any product defective in material or workmanship. All warranty repairs and service must be performed by General Sleep Corporation. Contact General Sleep to obtain a Return Material Authorization (RMA) prior to shipping systems back for evaluation and/or repair. 1. Damages resulting from misuse, abuse or accidents. 2. Corrective work necessitated by repairs made by someone other than General Sleep Corporation. Do you have a list of patents regarding the Zmachine? Kaplan, R., Loparo, K., Wang, Y.
Kaplan, R., Wang, Y., Loparo, K.
Kaplan, R. F., Loparo, K. A.